As the name implies, Double Brutal is a double album. The first disc includes more songs based off of Arnold quotes with Ahhhnold/Tim conversations in between. The conversations are still pretty funny, but they're not the reason that I enjoyed their first album. Considering that the songs were all written and recorded in a short period of time they are actually pretty impressive. The drumming is amazing, the solos (all by guest guitarists) are furious and the breakdowns are brilliant. Obviously, the lyrics are very tongue-in-cheek and not meant to be taken seriously. Tim's vocals are all over the place as he switches between deep growls, high-pitched shrills, and some clean singing to round it all off. For me, the highlights are Come on Cohaagen, Give Deez People Ehyar, I Need Your Clothes, Your Boots, and Your Motorcycle, and Come on, Do it, Do it, Come on, Come on, Kill me, Do It Now. Unfortunately, the album is pretty short this time around (30 minutes) but I guess that's where the second disc comes into play. This disc offers an additional 23 minutes of brutal cover songs (and more of those conversations in between) to keep you satisfied. They covered The T2 Theme, Hell Bent For Leather, Trapped Under Ice, Iron Fist, I Turned Into a Martian, Killing is My Business… and Business is Good!, Tactically Dangerous – Cannibal Commando, and Gotta Go. Musically, they kept pretty close to the original arrangements only really changing the sound to match the other ADM songs. The hardest thing for me to wrap my head around was the vocals. I grew up listening to a lot of these songs, so to hear Dave Mustaine's snarl replaced with Tim Lambesis' growl was a bit of a head-trip. But otherwise the covers are a great addition to the ADM library. This album (as with the first) is a must own for any Thrash Metal fan. The packaging is pretty slick and the content is fantastic, considering the album was all done in a short period of time. I can think of a number of artists that take YEARS to write albums and they don't even come close to as good as ADM. Oh, and aside from the solos and Ahhhnold vocals, Tim did everything else on this record. Like, EVERYTHING. 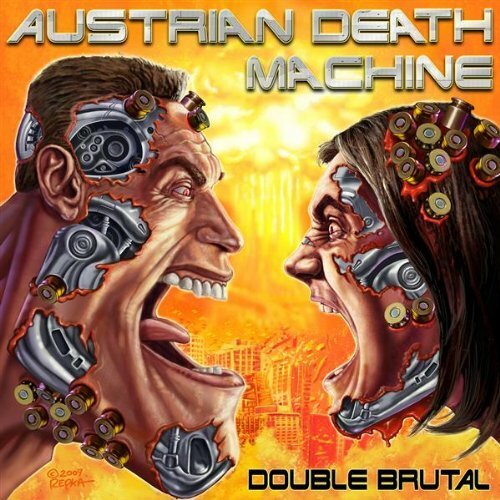 I know the dude (and As I Lay Dying) gets a lot of flack because of his religious beliefs, but with a band like Austrian Death Machine fans and haters alike should have a little more respect after giving their two albums a listen. I give this album an A for NEEEEEEEEEEEEEEEEEAAAAAAAAAAAAAAAAAAAAARRRRRRRGH! Okay that doesn't make sense......but I'm sticking with it.